Hazel Blomkamp has done it again! 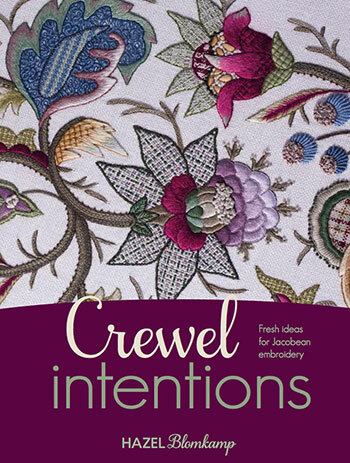 If you fell in love with Crewel Twists, Hazel’s first book published in 2012, you’re going to love her new book, Crewel Intentions, too! 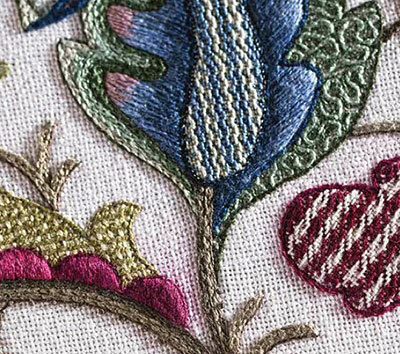 In Crewel Twists, Hazel introduced us to her unique and colorful approach to surface embroidery. 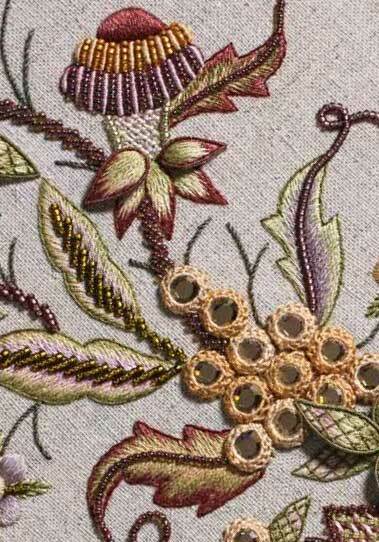 Incorporating beads, a huge variety of stitches and filling techniques and various types of threads, her embroidery designs are Jacobean flavored with a decidedly signature look to them. She carries this forward in Crewel Intentions by combining the same approaches found in Crewel Twists, with a few new twists! 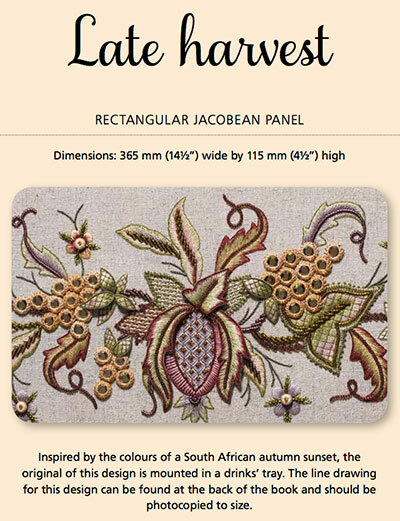 Hazel’s designs have a contemporary Jacobean flair. They’re colorful and textured and they incorporate all kinds of stitches. These are the types of embroidery projects you just can’t get bored with while stitching, because there’s so much fun stuff going on in them, some of which can be totally surprising. And yet, they come together in a beautiful, cohesive whole. Here’s the line up of the contents. 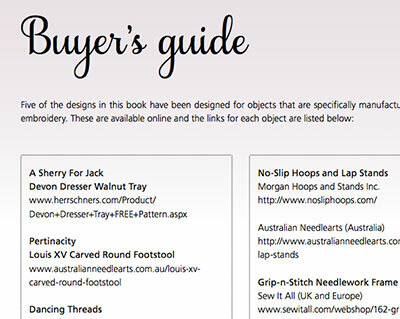 The first part of the book covers tips, materials, tools, and stitch instructions. I don’t like using a thimble but find that a hole develops in the tip of the finger that I use to push the needle through the fabric. Murphy’s Law dictates that on every third stitch, the back of the needle will go straight into that hole and the pain will cause me to go straight through the roof. I place a blob of superglue on that spot, hold my finger in the air for a few minutes and let it dry. Once that blog is dry it will be rock hard and a needle will not penetrate it. It peels off after a few hours, I promise. It’s only in cartoons that superglue victims have to be taken to the emergency room with glasses stuck to their foreheads. Yep. I do it all the time. I also use it to close up those painful little winter-skin fissures that sometimes develop on the side of my finger where I hold my needle. Works like a charm. 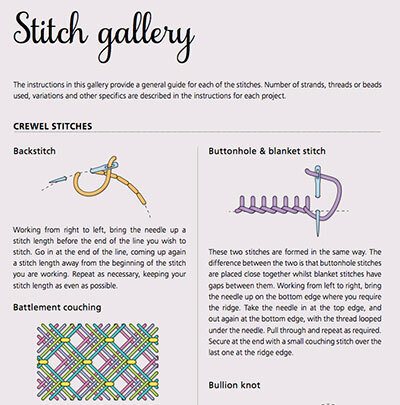 After the tips and materials, you’ll find the stitch gallery. 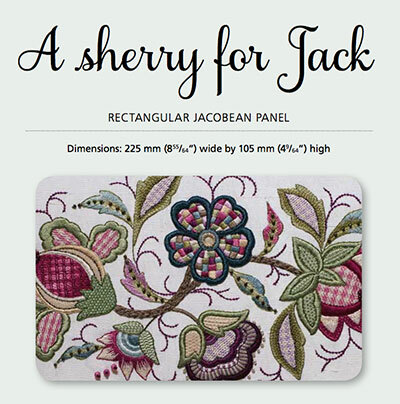 The stitch gallery offers clear stitch diagrams for all the embroidery stitches employed in the projects that follow. And here’s the part that takes the stitch gallery from expected to unexpected. There’s a fantastic selection on needle weaving. But, you say, needle weaving shows up in all kinds of stitch dictionaries! How is this “unexpected”? 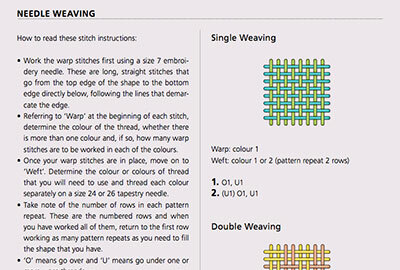 Well, I grant you – needle weaving does show up in most stitch dictionaries. But it’s what Hazel’s done to needle weaving that makes it different. She offers innumerable weaving patterns to create, with needle and thread, a whole slew of different woven fillings that mimic fabric. There are striped fillings, checked fillings, twill fillings, several plaid fillings, and plenty of in-between patterns, too. Check out those fillings! They’re fantastic! Don’t they just make you tingle all the way down to your toes? Think of the possibilities for embroidery when you start mucking around with these types of patterned fillings! …followed by instructions that are broken down by section. The design is portioned off into manageable sections. 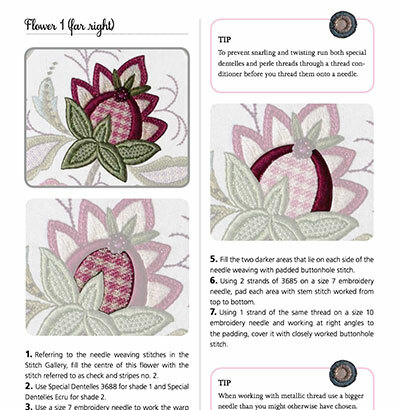 The completed section is shown highlighted in a photo, and then each element of that section is shown highlighted in a photo, and followed with step-by-step written instructions to complete that part, with references to the stitch dictionary in the front of the book. Throughout the project instructions, you’ll find handy little highlighted tips to help you through. The project photos show various finished items – like serving trays, footstools, clock faces. You can easily adapt them to other finishing purposes, though. 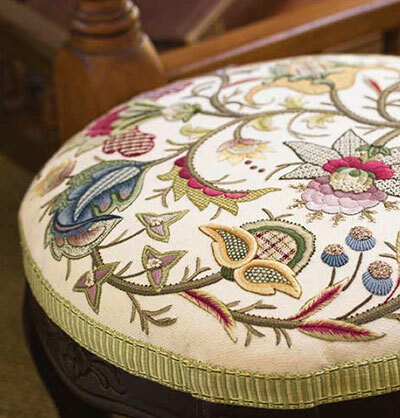 I think this footstool is swoon worthy. I need it in my living room. 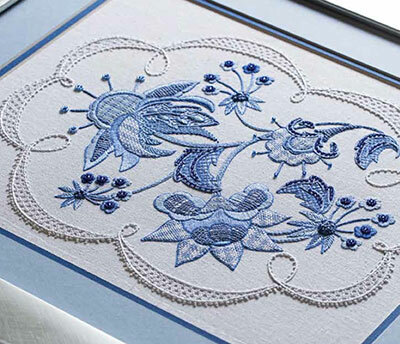 You can see clearly the use of the needle woven fillings in the petals on the blue and white project. And I love that whitework frame around the blue – so pretty! A clock face! I love the shading in the latticed petals and the vibrant colors! 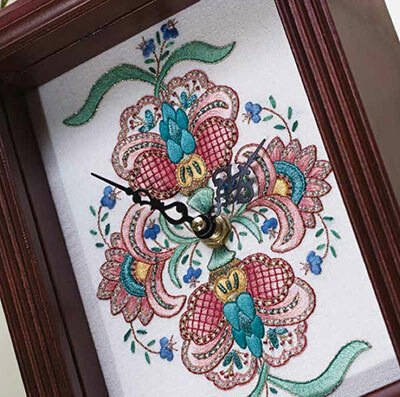 Again, it doesn’t have to be finished as a clock face, but this is a good example of something different to do with a piece of embroidery. Each project in the book is progressively more appealing. This autumn beauty towards the end of the book is my favorite, I think. It’s full of texture and dimension, with beads, stumpwork leaves, and padded stitches. I love the treatment for the grapes! 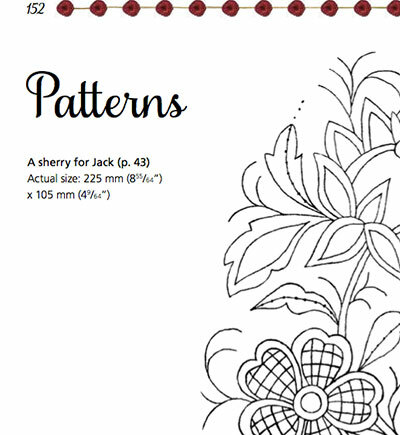 …and lastly, the pattern section, with line drawings for each project. All in all, another terrific embroidery treat, this book! 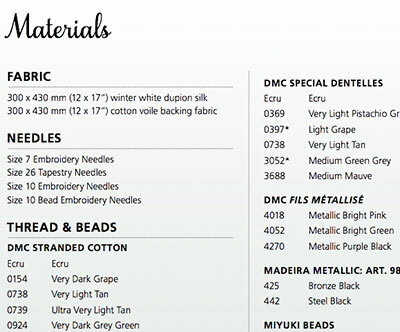 And definitely a must-have for your embroidery library. 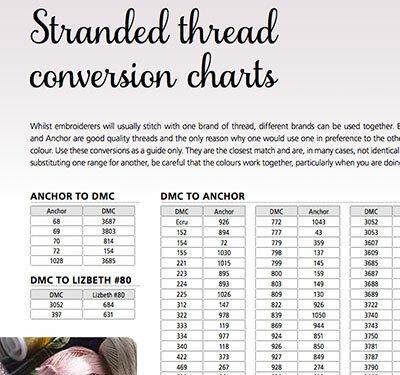 Even if you don’t work the projects, there’s a ton of good information and some really interesting techniques that you can incorporate into your own embroidery. In the US, Crewel Intentions is available through Amazon. Worldwide with free shipping, you can find Crewel Intentions through Book Depository. Dear Mrs. Corbet, I predict that by 2016 I will be filing for bankruptcy thanks to you! 😉 Time to start nagging for an Amazon gift card! This book is stunning! Absolutely beautiful! I plan to get this one. Thanks for the review. I am starting a new project from Hazel’s Crewel Twists and trying to learn needle lace.. needle lace is tricky and some patterns are easier than others. I am going to make cushion cover and making another one with perhaps matching design and similar in color but with different filling techniques would make a very nice matching pair. Those are incredibly beautiful designs, much more involved than the usual satin stitch, back stitch and French knots. I find the names of her designs interesting. I don’t even know what “pertinacity” or “inflorescence” mean but that’s what makes it tempting to look through. Thank you for the new book,I loved crewel twist, it is not really easy to translate because the names of stitches are different with my mother tongue, and again I refer to your site and your advice, in short a lot of work before making any point … I love the atmosphere of Hazel. I already own “crewel twists” and I am working on the grey shades design. You are right when you say that this is the kind of projects you can’t get bored with. I really enjoy stitching it. You can see the WIP on my blog. Just received your newsletter re: Crewel intentions. I purchased Crewel Twists when it was first published. When I saw some of the lovely projects in the new book, espesially the blue on white and the autumn piece, I had to order it on Amazon straight away. Scrumptious. I hope to make a start on one of them when the book arrives. Thanks for letting us know about this new book. What a lovely informative book, I love the clock it’s so unique and the beaded grapes are lovely also the weaving is amazing, I also like the sections on instructions which are very detailed. There are so many beautiful embroidery projects in the book this is definitely going on my wish list. I’ve not tried superglue thats a technique to be tried. Thanks for reviewing Crewel Intensions and sharing your thoughts with us. Another book to add to my list! Thanks for sharing, Mary! What a beautiful book! I hope to meet Hazel at Beating Around The Bush (Australia) in September. I am jealous, what luck you are. Me I want go to Topeka (the name of this town : dream) with Marie and learn with her, go to Cumbria to meet Plilippa and see Edimbourg, Glasgow and of course Adelaïde for discover Trish ,Hazel. Yes I know I dream. Please, said after you go your experience with hers. Thank Katleen!. Absolutely stunning! I have been peering, nose-pressed up against the window into the world of Crewel embroidery, long enough!! I think maybe my next project, I’m gunna do it. But would you recommend the Beginner’s Guide to Crewel Embroidery as a good place to start, or one of Hazel’s books? 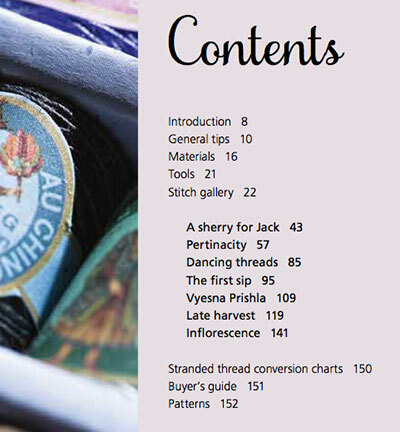 Ok ok, Yes I need another book for my library of needlework. And I have to say that Hazel Blomkamp’s first book, Crewel Twists is a delight. So I have absolutely no hesitation in ordering this next one of hers. My O my, how will I ever live long enough to play with all the lovely stitches and techniques that encompass the world of needle work!!! Thanks, Mary, that looks like a great book. I just ordered it. Utterly gorgeous! Thank you for sharing another beautiful book Mary. I’m so pleased to be reading your blog. I’m found a love for Surface Embroidery all thanks to you. Mary, stop it! Every time you review a beautiful book I want to add it to my shopping list! And then, when and if I buy it, I spend my time looking at the pictures instead of stitching. Seriously, though, many thanks for alerting us all to these lovely and useful publications. It is a real pleasure to learn of gems like this. I agree with you.How does she? she is really passionate for our greatest pleasure, amazing and confusing as also the prospects it offers are great. Not having at least one book of Hazel Blumkamp is remaining in the dark ages. As with you Mary she tries too impart her enthusiasm and love of the art that you both do so magnifiently. I too, like her handy hints. Super glue is great as is windex for spots but every one please understand SG it is not meant for the skin but if used in minute drops it will do the job. Superglue is great on small skin breaks and the thimble. But I have found I don’t use it up quickly enough and it goes dry. Keep away from small children and mother’s who think it is Golden Eye ointment. and used it to treat her child’s sore eyes. Yes and it was not me but I was theatre nurse helping Dr to remove it. Mary I did find that it does wear through very quickly. My handyman find for holey thimbles is a two pack putty. I take a tiny pinch of the outside putty and then a small pinch of the centre part roll them together well, and pinch a small piece of and put that into the thimble, tapping it very flat and especially into the little needle hole. I use a used rubber end pencil as the tapper. Then do the other side over the hole. If you have tapped or pushed well from the inside you should see a little grub like bit come through. Use the blunt lead end of the pencil and tap the grub flat. There will be some putty over. Don’t throw out, roll remainder into a ball and flatten slightly and with a large-ish eye end of needle make shallow indents over the top of the putty ball. Leave it to harden. Over night. I have found a small metal skewer or the blunt end of the pencil. This putty ball will come in handy. The putty you can find in the paint and putty section of the hardware shop.Two sorts one for wet areas and the other one I use is for dry use. I do not understand how the putty can fill small wounds very painful needles on the skin. Probably because of machine translation, I did not understand, this happens to me quite souvent.Je also think super glue is not good for the skin, so I put the tape or scotch when I ‘really bad, because I do not like having “more” on my fingertips. Thanks to you I’ve booked this wonderful book by Book Depositiary with free shipping and I would like to thank you for all information you gave for everybody all around the world. It’s not useful to find everything about a new article described by a personnal site. Have a nice day and week end. I am pleased to say this book is available now in the UK. I know because I just ordered it! I am nearly done on my RSN Jacobean assessment piece and I have got really hooked on crewel – it is so much fun! Thanks for the superglue tip. I am developing callouses, but not fast enough! Putty is not for skin repair. Super Glue can be used. Sparingly.. Language, seeing it done is better than talk. I hope you your machine helps you to understand. Thank you Martha for your answear, I know I’m a disaster in English, I learned German 7 and 5 years of English in high school and I’m hopeless. I’m good to still open the dictionary, it is often preferable to machine translation. This book is fabulous. I bought it after looking at your post and it has joined the first book. They sit proudly on my bookshelf, a great source of inspiation. I have just been privileged to spend the day with Hazel Blomkamp. She is delightful, and a terrific teacher. Of course, her designs are to die for! Beautiful! Really love the blue work. Also love the stitch gallery. Thanks for the offer. Thanks so much for the review. Plan to buy both books now. I was so hoping that this book would be under the Christmas tree for me and it was not, so I would truly love to have this. The needlework and colors are absolutely gorgeous. I have so wanted one of her books. A great review of a wonderful book. LOL! It’s my dad’s solution to everything! Previous Previous post: Beginner Embroidery? Well, Yes and No…!